Chances are you’ve visited DC recently: whether to protest, or to escape the polar vortex by heading south of the Mason Dixon line. 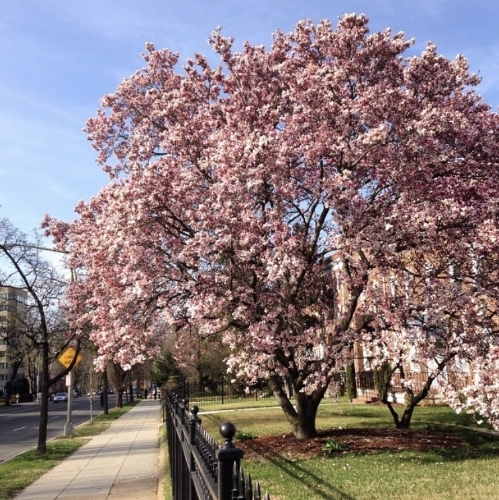 Unlike New York City, which goes from freezing to swelteringly hot seemingly overnight, DC can boast a prolonged spring. The city actually blooms—the gift from the Japanese that keeps on giving. But cherry blossom season isn’t the only time to visit DC (though it is the most basic): our nation's capital is increasingly becoming a top foodie destination. The Washington Post named DC the top food city in America, and—although they may be biased—this sentiment is echoed by Thrillist, Bon Appetit, and Zagat. With that in mind, we’ve rounded up the best restaurants to visit in the District, whether you’re looking to lunch with the who’s who in national politics, or seeking out the best Ethiopian food in the city. Our recommendations include spots in Columbia Heights, Shaw, Adams Morgan, Dupont, Petworth, and Logan Circle. Yes, there’s more to DC than Georgetown. Read below and find out. Another scene-y spot located in the Four Seasons, known for being one of the best restaurants (with the best service) in the city. Our recommendation? Order the bourbon tasting—the server comes over with an entire cart of bourbon and will walk you through all the options. Ivanka Trump is often a daily presence at lunch (though this may not be a selling point). The bar is a scene too and good for people (or celeb) watching. Kevin Spacey is known to be a frequent patron, though that may not be a selling-point these days either—either in the fictional D.C. or the real one. This place is a Washington institution. It’s definitely a power move for politicos to be seen here at lunch hour, and dinner guests range from John Kerry to George Clooney. An old-school Italian restaurant with a nice patio, white linen tablecloths, and charismatic waiters. Le Diplomate in Logan Circle does a great brunch and is extremely popular. This French bistro on 14th street is an Obama-era favorite and is perfect for a leisurely or festive brunch. It’s a Steven Starr restaurant, and the atmosphere is trendy and fun (though a bit crowded). Spanish tapas bar on 14th Street with a very lively atmosphere. Definitely need a reservation in advance—the spot is very popular. This French restaurant located on a quiet street in Georgetown is a must-visit. Great French restaurant on a quiet street in Georgetown. The best part is the Bar à Vin next door—visit after dinner. It’s the coziest place in all of D.C., with a fireplace and old wood paneling. A perfect date spot. Stay in the neighborhood to check out Chaia. This former farm-to-taco stand put down roots at this adorable store front in Georgetown. The all-veggie menu offers fresh and simple ingredients, a nice detox from your regular taco selections. Located up Connecticut in a more residential area, Little Red Fox offers an unbelievable made-daily food selection, and amazing coffee. Recommended for their incredible, daily-changing Italian antipasto selection, and wood-fired pizza. The most amazing Thai/Lao food prepared by incredible Chef Seng in Columbia Heights. The food is fresh, interesting and delicious. Don't skip the crispy rice salad. Tucked in a side street just off U street, this spot offers an ever-changing menu of Japanese home-cooking, including fresh sashimi and other Japanese delicacies. DC boasts a huge Ethiopian population, so there are a lot of West African restaurants and the Ethiopian food offerings are pretty vast. We recommend hitting up Keren in Adams Morgan—the restaurant is huge, the atmosphere is fun and lively (come early, stay late), and you will find yourself sampling dishes you’ve never tried before. Great for groups, because dishes are prepared to share. Very upscale Indian food: the Palaak Chaat (crispy spinach) is life-changing and should be ordered immediately. This is a very special DC location, so you should visit even if you don’t think you like Indian food. Maybe (probably) dinner here will change your mind. Another option for pizza (this pizza fare is wood-fired, though it doesn’t offer table tennis). This tiny, gourmet pizza joint in Petworth has far and away the best pizza in DC. It used to be a pizza truck before the restaurant opened. Another tip? Get the empanadas. They are amazing. This Belgian restaurant on Macarthur Blvd is in a residential part of D.C. about ten minutes outside of Georgetown. A much-loved favorite because the Belgian cuisine is consistently delicious, and the atmosphere is understated and elegant. Our recommendation? Go for the fries (always) and the chocolate mousse. If you can’t get that reservation, and you’re in the mood for Spanish tapas, head down the street to Estadio, and stay late after dinner is finished for the amazing cocktails. Another great spot for cocktails. This raw bar & restaurant in the Navy Yard on the SW waterfront has a killer view, unbelievable seafood, and (like we said) some of the best drinks in the district. This Jose Andres restaurant downtown has the best Turkish/Mediterranean food in the city. The atmosphere could be improved upon, but the food can’t be beat. Another spot where the atmosphere is pretty nondescript, but the food is unparalleled. This restaurant on 14th street in Columbia Heights has the best pho in the city—trust us on this one. Also located in Columbia Heights, El Chucho offers excellent tacos and margaritas—what more could you want? If the name doesn’t have you hooked already (it’s pretty well-Instagrammed, of course), then you should visit this spot right on the canal in Georgetown for the amazing coffee. Also, the to-die-for cupcakes gives Georgetown Cupcake a run for its money. This former pop-up coffee bar put down roots in this industrial space (also located on 14th). Check out the caffeine (duh) but also their homemade baked goods. Hint: order the scones! Wish you’d booked a trip to Paris instead? Head over to Laduree and satisfy your sweet-tooth. Hungover and missing New York? Check out DC's take on Russ and Daughter's cafe right in Dupont for that same contemporary spin on Jewish classics (and cocktails)! This go-to coffee shop was originally in Shaw, but now has spots all over the city, so pop in when you need to refuel from sightseeing/ Cherry Blossom trolling. This coffee shop in Columbia Heights is a best-kept secret and is totally underrated. Order the cold brew, trust us. This café is also located in Shaw, and has great coffee and lunch. The outside is covered in grape vines, and the interior is cozy and perfect for a winter afternoon. It’s the perfect spot to while away the hours reading/writing/generally being lazy. Go forth and luxuriate. Special thanks to Dane Evans, Cara Manket, Meredith Murphy, Biff Parker-Magyar, and Aidan Pongrace for the insider tips!